Our expert techs know exactly how to troubleshoot doors that have stopped working. They can also install new doors should your current one need to be replaced. There are three main types of opener, though there are hundreds of models and dozens of garage door manufacturers. Firstly, there are chain-drive openers. These are often the most affordable and reliable of the three models. A draw-back can be that they are slightly noisy compared to other models. Belt-drive openers tend to cost a little more, but are efficient and very quiet. Screw-drive openers can be slightly noisy but require the least amount of maintenance of the three model types, so they represent a kind of middle ground. With so many opener models and manufacturers, it can be confusing to figure out which one will work best for you. While most models are made with similar specs, some do come with a few unique features. 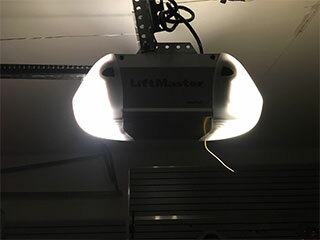 For example, LiftMaster and Genie garage openers use a special rolling code technology. This adds an extra level of security to your home by preventing intruders from hacking into your system. Other special add-ons might include a back-up battery generator so that your garage door continues to run in the event of a power outage. Some brands also offer WiFi compatibility and Bluetooth so you can control your door from your phone. In the same way that any system needs to be maintained to keep it working at its best, so does your opener unit will need a little attention from time to time. Regular maintenance can prevent small hiccups from escalating into larger and more expensive problems. During a maintenance visit, our technicians will make sure all parts of your opener are working properly, from the rails, chains or belts to the circuit board and opener. Owe can also perform realignments for a smoother opening, and assess the health of your safety sensors. We'll fix or replace any damaged components so that you aren’t left scratching your head wondering your opener has suddenly stopped functioning. Our team of technicians at Garage Door Repair New Rochelle is here to help you with any garage door related issue, whether you need emergency assistance or are planning a whole new install.